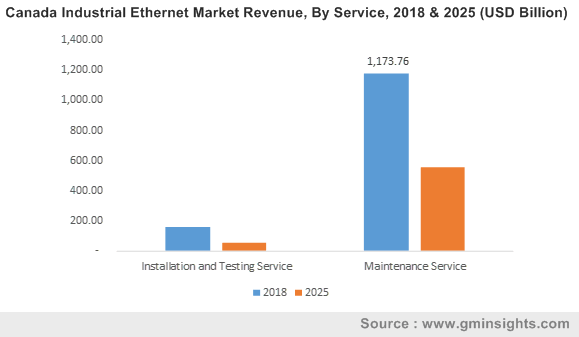 Industrial Ethernet Market Trends « Global Market Insights, Inc.
A highly pivotal space of the smart technology vertical, industrial ethernet market has garnered commendable acclaim in the last few years. Industrial ethernet protocols are known to establish a flexible, scalable, and ubiquitous network that conveniently connects components as and when required. The demand for this software is exponentially high among myriad end-use sectors on account of the rising expenditure on infrastructure and the increasing requirement to enhance performance and network flexibility. Indeed, companies have even been upgrading their already existing Ethernet protocols for performance improvisation, strengthening their stance in industrial ethernet industry. Citing an instance of the aforementioned statement, recently, The CLPA declared that Renesas Electronics plans to incorporate a gigabit physical layer in its R-IN32M4-CL2 IE communication system-on-chip, through which R-IN32M4-CL2 will now be able to support the CC-Link IE network connectivity with reduced external components. In addition, it would be able to aid automation system developers embed the CC-Link IE into variable speed drives, PLCs, robots, and motion controllers. Industrial Ethernet market has essentially risen to prominence due to the extensive integration of IoT in numerous fields. Technically, industrial ethernet is an improvement over the traditional ethernet in terms of the use of rugged cables and connectors and better determinism. Enhanced determinism in fact, is one of the major factors that is expected to drive industrial ethernet market as industrial environments have a key requirement for determinism. Packets of data have to be delivered and received with precision every time, while data delay may end up in disasters – may be an unacceptable flaw in production process. Certain protocols of industrial Ethernet such as EtherNEt/IP, PROFINET, TCP/IP have been deployed for achieving better determinism, thus impelling industrial ethernet market growth. The emergence of the industrial Internet of Things has opened new growth avenues for the industrial ethernet market as IoT will increasingly utilize the higher bandwidth and real time capabilities provided by industrial ethernet. IoT is being majorly deployed in the automobile industry to produce smarter cars in the future – quite overtly, the automotive sector will come to emerge as a prime growth avenue for industrial ethernet market. Smart automobiles, besides having more streamlined on-board functionality, are expected to have futuristic features like traffic light recognition system, lane departure warning system and advanced driver assistance system. Automobile based industrial ethernet market is expected to grow due to the reliability and versatility of industrial ethernet which will in turn gravitate automobile manufacturers. Experts assume that the cars of the future will be equipped with 60 to 100 Ethernet nodes. Besides the automobile industry, the energy industry has also largely adopted the use of industrial Ethernet to establish reliable, cost effective and fast communications systems. The wind power generation industry can be considered as an instance if the growth of the industrial ethernet market is to be evaluated through the energy industry. Communication equipment used in wind power generation operations is required to be hardy and able to withstand fluctuating temperatures. Wind turbines house a complex control and automation system that must communicate with other wind turbine systems to achieve a viable alternative source to traditional energy. Industrial ethernet facilitates this flawless communication thus forging growth avenues for the industrial ethernet market with the rising prominence of wind power industry. The competitive spectrum of industrial ethernet industry comprises a host of biggies such as Honeywell, Cisco, ABB, Siemens, Schneider, and the like. These companies have been striving to enhance the scope of industrial ethernet market via tried-and-tested growth tactics such as establishing partnerships with automation solution vendors. As the demand for automated and smart solutions increases, industrial ethernet market is expected to chart out a highly lucrative growth map over 2017-2024. This entry was posted in Sustainable & Smart Technologies and tagged Communication Interface, Connectors, Controller & Processors, EtherCAT, Ethernet TCP/IP, Ethernet/IP, Gigabit, Global Industrial Ethernet Market, HSE, Hubs, Industrial Ethernet Market, Industrial Ethernet Market Forecast, Industrial Ethernet Market Growth, Industrial Ethernet Market Research, Industrial Ethernet Market Share, Industrial Ethernet Market Size, Industrial Ethernet Market Trends, Integration & Testing Service, Maintenance Service, Modbus TCP/IP, Powerlink, PROFINET, Router & Gateways, Sercos III, Switches.